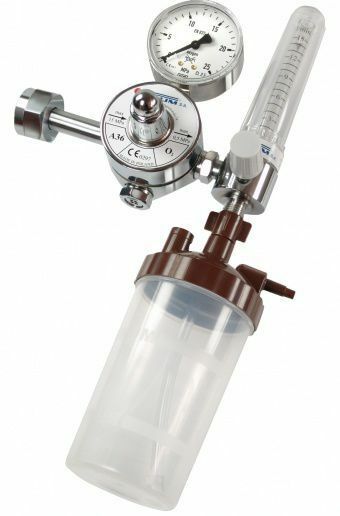 Reducer for oxygen (O2) from the dispenser and the humidifier, when combined with oxygen tank, is designed to reduce the pressure, determining the required flow and moistening the oxygen taken from the cylinder. The pressure in the cylinder indicates a pressure gauge mounted on the reducer. Flow control allows you to specify the patient from 0 to 15 l / min, humidified oxygen. At the same time it is possible to obtain a moistened oxy-air by turning the ring of air intake (the A36 in. I).